Farm and Home Supply cares about your pets. Most of us have dogs or cats, even other small animals. That's why we have huge animal health departments in our stores and stock thousands of items online. Dog food and dog treats? Tons of it! Cat food and cat treats? Aisles full! Dog kennels and cat condos? Yep. We even stock birding supplies like bird seed and bird houses. You'll also find rabbit hutches and rabbit food, and even bedding and feed for other small pets and critters. For nuisance animals and feral runaways, we provide metal wire animal traps to safely cage them until release. 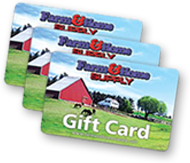 Farm and Home Supply carries the brands you trust and pets love: Kaytee, Mazuri, ADM, Nutrena, Blue Buffalo, Diamond, Fancy Feast, Ideal Balance and Science Diet, Iams, Purina, Taste of the Wild, Eukanuba, Greenies, and Milk Bone. When your furry friends gets the itches we have flea and tick control by FrontLine, K9 Advantix, and specialty treatments from Farnam, Panacur, and Bayer. Accessories and toys? You bet! Leashes, tie outs, water bowls, food bowls, pet clothes, kennel pads, even training devices and wireless fence systems. Visit our stores for vaccines and medication.